Showtime with KIBO! 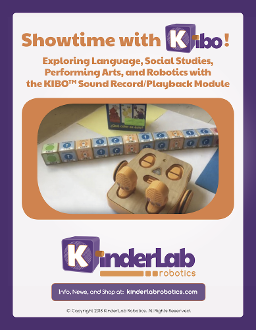 provides up to 10 hours of new KIBO activities based on the Sound Record/Playback Module. This research-based curriculum booklet supports the KIBO Sound Record/Playback Module with art, literacy/language, and social studies connections. Students will create bi-lingual translating robotics; tour guide robots to show off their favorite cities; and variety show performers incorporating song, dance, and more.